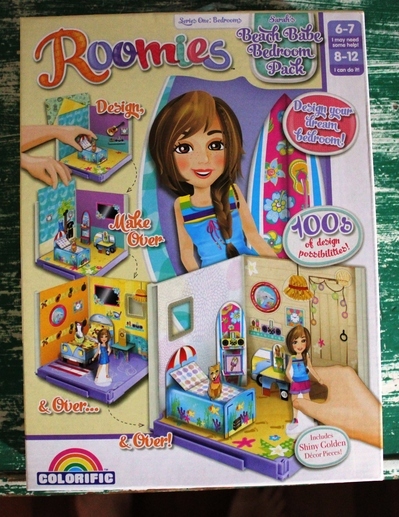 Roomies by Colorific are a great gift for young girls (5 -12 years old) and will keep them entertained for hours, setting up their own unique interior designs. Younger children (5 - 8 years old) will require assistance folding some of the fiddly furniture such as the bookshelves, but older children will really enjoy the challenge of putting it together all by themselves. 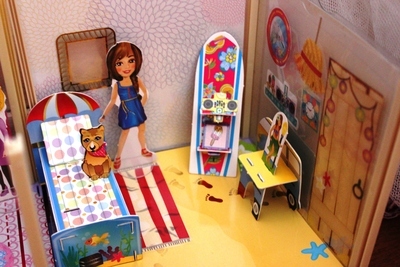 These are a very cleverly designed range of 3D bedrooms made of strong cardboard, which you can collect and then connect into each other. Each set comes with its own Roomies character with a unique personality. You can choose from the Beach Babe Bedroom (see pictures above with the character Sarah), Popstar Bedroom, Gadget Girl Bedroom, Glamor Girl Bedroom (see left side of picture below with the character Charlotte), or Ultimate Designer Bedroom . Girls will enjoy changing the reversable lounges, carpets, tables, walls or the bed from day to day, and week to week. Each Roomie comes with plenty of stickers to decorate the walls and two color themes to choose from. These are from the current Bedroom Series, and I assume there will be more series to come, so you can connect together an entire house. Wow, what fun.